Guests who join us on the Taste of Sicily, our oldest and most requested bike tour, come away with vivid memories of the breathtaking views and the amazing food. Some are also surprised to learn how Sicilian cuisine is very different from what they experience in their home countries. While pasta is a main ingredient in many dishes you’ll sample when you embark on this 9-day Sicilian bike tour, you’ll discover how this island is known also for a variety of seafood delicacies. Squid, or calamari, is used in many dishes, from appetizers to main courses. Our guests have enjoyed it fried and in salads with lemon juice and olive oil, and squid features in the popular frutti di mare dish, which translates to “fruit of the sea.” Here, slices of squid are combined with mussels, shrimp and scallops and served over pasta seasoned with garlic and olive oil. If you’re feeling adventurous, twirl your fork around a few strands of squid ink pasta. 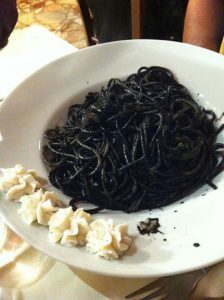 Unlike traditional noodles, the black pasta has a distinct salty flavor but it’s not too fishy. It’s a favorite in Sicily, for its dramatic look and unique taste. While on your tour, you should also try the island’s signature dish, pasta con le sarde, or pasta with sardines. These small, flavorful fish are cooked with fennel, olive oil, wine, and pine nuts or almonds to create a unique meal. Sardines are plentiful here and may also be enjoyed stuffed and fried as appetizers or as a topping on pizza. Swordfish is another popular option. Guests have enjoyed swordfish steaks grilled with olive oil and lemon, as well as cooked with a robust tomato and almond sauce. However you prefer it prepared, swordfish pairs well with a nice glass of white wine after a long day of cycling along Sicily’s coast! These and other succulent seafood dishes are only one reason to join us in Sicily for an unforgettable cycling tour. There’s so much more on the menu to sample! You’ll have the opportunity to browse fresh produce at open air markets, and take part in a cooking class so you can bring the flavor of Sicily home. Reservations for the Taste of Sicily tours scheduled for March 24 and April 9 are now open. Make this coming Spring break your most memorable with leisurely rides along Sicily’s rustic countryside and abundant vineyards. Contact us today for more information.